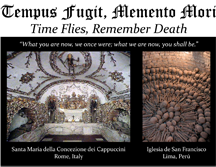 There’s a church in Rome, known as the Church of the Bones, filled with skeletons, skulls, and bones of all sorts that serves as a reminder of how short our lives are. An inscription there reads: “What you are now, we once were. What we are now, you shall be.” An ancient saying comes to mind during this Season of Lent: Tempus fugit; memento mori. Time flies; remember your mortality. 1. Remember: Remember that one day all that we have will pass away. What will endure is who we are in the presence of the Lord – what we are interiorly – which is why Lent calls us to remember our mortality and our immortal soul. 2. Return: The Lord invites us to return to Him. In Ezekiel 18:30 and elsewhere, Scripture calls us to “return to the Lord” for this is an acceptable time…the time of conversion. 3. Repent: When you return to the Lord you have to repent. You have to bring your sins before Him and express contrition and sorrow for them. 4. Rend: The Lord says “Rend your heart, not your garments.” In other words, be surprised, disgusted even, by your sins, and break away from sin, realizing how sin offends God and neighbor. 5. Reconcile: Reconcile with the Lord. Settle your accounts. Ask and receive forgiveness and the grace to start again. 6. Remove: Remove whatever is an obstacle for your growth in holiness and conversion this Lenten Season. Don’t just sit there: do something! Do whatever it takes to be holy. 7. Renew: Renew your commitment to God. During the Lenten journey we prepare for that moment at the Easter Vigil at which you and I will renew our Baptismal promises. Get ready! This is why we pray. This is why we fast. This is why we give alms. Because we want to cleanse our souls of our sin and train ourselves as Jesus did in the desert, with the temptations. We have forty days to cleanse ourselves and train ourselves for the spiritual battle we engage in everyday. This Lenten journey is a time for us to intensify our prayer life, to intensify our self-denial through fasting and the other things we give up. We give them up so as to have mastery over our appetites and our bodies, which will then allow our souls to be free to soar high. I invite you to take this time of Lent seriously. Make this a time of renewal. Make this a time of training. Make this a time to identify those character flaws and those areas of sin –maybe even repetitive sin– that need to go. They must go, so that we may become all that God wants us to be and do all that God calls us to do. Spring cleaning has arrived: do it well. And remember my Seven R’s: I trust they will help you like they help me.